That's an easy one. 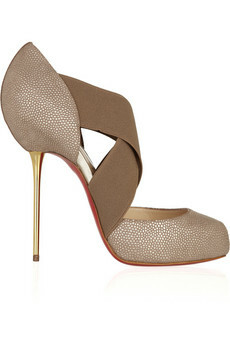 We love these Christian Louboutin pumps because they are hot! But if we must give details, you know the feeling you get right after a fresh haircut? You walk out of the salon feeling 10 feet tall, you are confident and think that you can do anything? That's how we feel about these stunners. Every stride taken in these is a step in the right direction. You just can't go wrong with soft gold stilettos. Natasha Platform pump by Bebe, $70.91.